It’s no secret that our team at Wristband Bros wants to help you Express What Matters through great looking custom wristbands. What people don’t know is once those wristbands start venturing out into the world, we transform into proud parents who love seeing photos of our children’s travels. Enter the hashtag #ExpressWhatMatters. By tagging your wristband photos with #ExpressWhatMatters we can check in and see how our lovely children are doing. Are they well fed? Do they look loved? And you can win a $100 gift card. I know what you’re thinking – Why the heck do I care if you can check up on your wristband children? Well, first off – RUDE. 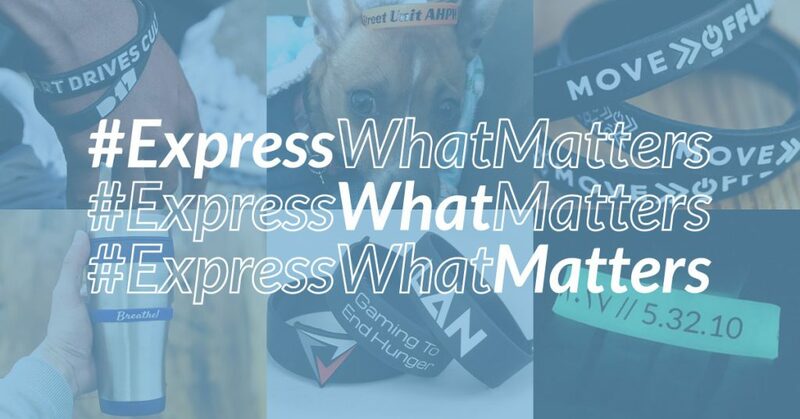 Secondly, we’ve created a giveaway to reward customers like you who share their wristbands and #ExpressWhatMatters to the world. Share a picture of your wristbands on Facebook, Instagram or Twitter. At the end of every month we will randomly choose one winner to receive a $100 Wristband Bros gift card. View our contest rules here. So what are you waiting for? Get out there and start to #ExpressWhatMatters! Need some wristbands to share? We’ve got you covered.